You can make a secure online donation here by debit or credit card. Orangutan Land Trust, The Gate House, Windley Hollow, Windley, Derbyshire DE56 2LP UK. Please make your cheque payable to Orangutan Land Trust. You can make a standing order by completing this Standing Order Form. 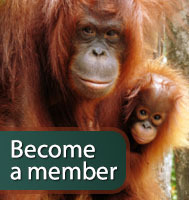 Orangutan Land Trust is registered by the Charity Commission of England and Wales, Charity Registration Number 1131878. For as little as £2 a month, you can show your commitment towards the survival of the orangutan and help make a difference. You can adopt an orangutan from BOS Nyaru Menteng for only £10 per month here. By becoming a Strategic Partner, you help ensure that the work of the Orangutan Land Trust can continue to provide sustainable solutions for the survival of the orangutan in the wild. Perfect for ethical corporations with a strong commitment to sustainability. If you are interested in making a financial investment into one of our forest projects, please contact us by email to arrange an opportunity to discuss what is available. If you have any questions or suggestions, please email us.